Could messiness be the mother of invention? ZipBin® storage originated when my inventive 10-year-old son, Max, and I put our heads together for some true "out-of-the-box" problem solving. Like many boys, Max loves plastic building blocks. And he likes to dump them on the floor-CRASHHH!! Of course, I loved to see Max play, but I groaned when I heard that loud mess of blocks spilling everywhere. Neither Max nor I liked cleaning up all those little pieces.Inspired by our problem, we thought creatively about how to solve it until... what if Max's toy bin unzipped to a play mat and zipped back up, capturing his toys? That would take the work out of having fun. It would be neat! And that's the name we chose for the company - Neat-Oh!® - that would introduce ZipBin® storage to the world..."
I received the Road and Rail Large Zipbin for review. I can't say for sure who was more excited to receive the Road and Rail Large Zipbin - me or Cooper. I love this product for the simple fact that it is a neat way to store toys without looking tacky in our playroom. The colors on the outside of the bin are solid blue and red, which fit in perfectly in our playroom. Just the mere thought of not stepping on a toy car or train is enough to bring a smile to my face! Those things really hurt! Cooper loves the Zipbin for all of the reasons that are more obvious to a 4 year old - when the bin is unzipped, it becomes a playmat! Not only does Cooper enjoy being able to keep all of his favorite cars and trains in one container for easy access, but he can use this same container as a play area for all of said trains and cars! How much easier can it get? I personally can't wait for our next vacation. This will be such an amazing way to carry his toys while traveling, and the playmat is an extra bonus when away from his train table and race tracks that are just to big and bulky to bring along. Want to tidy up your playroom and organize that off-limits area in your home? 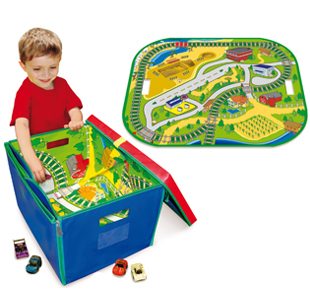 The ZipBin® Road & Rail Storage Toy box carry-case’s attractive, colorful exterior looks great in your child's room. When the bin is unzipped, it becomes a play mat. This travel epicenter is perfect for vehicles, trains, boats, farm play, construction toys and even planes! (The track is the same gauge as all popular wooden trains). When play is done, the play mat becomes a toy carry-case in a zip, capturing the toys inside for easy clean up! Store, stack and stow for another day as a globetrotting tyke! I am 100% thrilled with this product, and I feel like anyone with children will feel the same way about it. I would highly recommend any Zipbin product to anyone and everyone! BUY IT! You can purchase your own Zipbin at http://neat-oh.com/. WIN IT! One lucky reader will win their choice of Zipbin! Tweet about this giveaway! (Leave your Twitter name and a link) You can tweet this daily: “Neat-Oh! Zipbin giveaway at Opinions of a Moody Mama #giveaway @coopersmommy @neat_oh http://tinyurl.com/7arqooz "
I like Neat-Oh! on Facebook (Andrea Hamilton). I'm following Neat-Oh! on twitter (andreacouponz). I'm a facebook fan of ZipBin designs by Neat-Oh! under username Jennie Tilson. MANDATORY ENTRY: I am a Facebook FAN of "ZipBin® designs by Neat-Oh!®." I like Neat-Oh on facebook! FB fan of Neat Oh! I voted for you at Picket Fence Blogs on 12/31/11. I am a current Facebook FAN of yours. My Facebook ID: Kimberly Dunek-Buck. I 'LIKE' this giveaway on Facebook. My Facebook ID: Kimberly Dunek-Buck. I also entered your Zoobies giveaway. I also entered your "Design With Vinyl" giveaway. Voted for you on 1/1/12! Happy New Year! PROOF: You have just voted for Opinions of a Moody Mama! I am following neat-oh on twitter. my twitter name is scoobybabe2004. I am following opinionsofamoodymama on twitter, my twitter name is @scoobybabe2004.